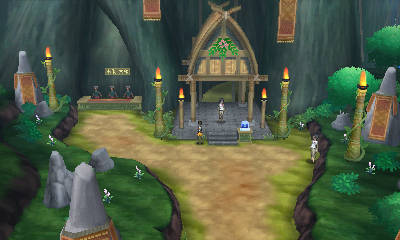 The Battle Tree is Alola's battling facility. Here, you can battle people with your Pokémon, or team up with a friend and take the battle tree on together. When you first go to the Battle Tree, you will be met by no other than Champion Red and Blue from Kanto. Blue will introduce you to them and then he will ask you for a battle. You can choose who you want to battle and when you defeat them, they will allow you access to the Battle Tree. Once you are inside, you have the option to take on the Battle Tree. The first time you go through you have to defeat 20 trainers with the Battle Tree master at the final battle. After that, you can go through the challenge again and can you can defeat as many trainers as you can. You can also buy battling items like Mega Stones and training items from the shop on the left hand side.